The holidays, especially Thanksgiving, are a time for being with family, enjoying meals, and shopping for loved ones. This season, Aptel is ready to make visiting family in Anchorage for Thanksgiving dinner or coming into town for holiday shopping that much easier with its extended stay options. Offering spacious rooms with either a single or double queen bed, Aptel Studio Hotel is designed to be your home away from home. Each room provides kitchen basics, high-speed internet, cable TV and self-controlled room temperature. With holiday season underway and Black Friday quickly approaching, checking items off your shopping list has never been easier. Aptel is located next door to the Northway Mall, home to a variety of local and chain stores, perfect for all of your gift-giving needs. On your walk to the mall, enjoy views of the Chugach Range and watch bush planes as they take off from Merrill Field. 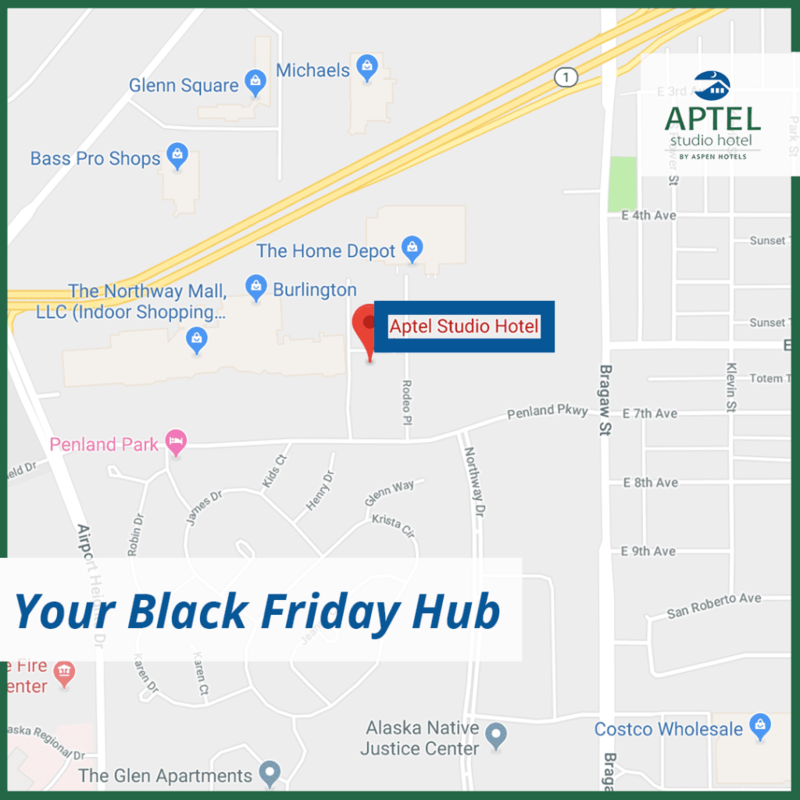 Aptel is also conveniently located near Glenn Square and Tikahtnu Center for additional shopping options and Black Friday deals. Take time for yourself before the hustle of Black Friday and have the hotel staff assist in local restaurant options that are open on Thanksgiving. Located just one mile from downtown Anchorage, Aptel provides a convenient location that is in close proximity to many local amenities and restaurants. More interested in cooking up a Thanksgiving dinner? With a grocery store within walking distance and your own kitchen with kitchen essentials, cooking at Aptel is just as easy. Whether you stay for a week, or make Aptel your home for the holiday season, we are happy to share the comfort and convenience our location provides. Don’t just visit Anchorage, stay with Aptel and have a holiday home away from home.